Monday started off with a bang. The bang was the sound of an SUV plowing into the side of my car at speed. I saw it speed up too late and hit the gas to take the impact behind me instead of on my door. The seatbelt held me firm; over thirty five years of faithfully clicking that on finally paid off. I walked away from this one, but not right away. The side of the car was shattered and I was covered with broken glass. I cleaned myself off as best I could and phoned home to let K know I had been hit, but I believed myself to be okay. I waited for the firemen to show up and when they did they put me in a C. collar. The ambulance arrived a moment later. The Jaws of Life were used to open my car door then I was placed on a backboard and strapped in. I’m a big girl and it took a few of the lads to get me out of the car. Anyway, as any good writer would, on the ride to the hospital I pitched my book to the Paramedic riding with me. I gave her my card and everything. There was quite a back up at the emergency ward and I spent a long while on the backboard before they came to check me out. How did I spend my time? Why mentally composing my blog post and working on my WIP, of course. Eventually it was my turn. They got me off the board, poked and prodded for a while, asked me silly questions to which I gave silly answers. Finally they pronounced me fit to go. I marched happily out of the building to see K just pulling up in the truck. I’m a bit stiff and sore, but nothing really; I’ve been in worse shape from wrestling with the dogs. As I always say, “Some days it is better to be lucky than good.” Monday was just such a day. The thing that is most humbling about this whole experience is the compassion of the people who saw it happen and took charge of the situation until the professionals arrived, the professionals themselves, and especially the wonderful friends I have on the internet. You hear people say, “I have hundreds of friends on the internet.” You know what? I do. The compassion and concern shown for me by you wonderful people is both uplifting and humbling. I swear I will do all in my power to be worthy of such loving friendships. You folks are so amazing; I love you all. Since I have published Hunter this round, I have only one main writing goal left. In this round I want to get my current WIP as close to 40K words as possible. Progress: I didn’t get much done here since my last check-in. I will try harder the rest of the week. Thanks for dropping by folks. If you’ve got the time, could you hit the *like* button on this page for me? Oh My God. How lucky were you? Did your airbag deploy? Sending you a BIG HUG and take care of yourself. Dodged a bullet this time, honey. Have liked the page, lol! I'm so grateful that you are okay!!! My goodness! Love that you pitched your book to the paramedic. That's awesome. Rest up now! So glad you are ok. I've been in two accidents which weren't my fault. One a head on collision and it usually took a few days to feel the full impact of the accident so be sure to take it easy and take good care of yourself. Prudence, you honestly are one of my favorite people online and I am so glad that you are okay. Yes as Indie writers (not there yet but plan to be soon!) we have to plug our book to everyone because no one else is going to do it. It shows how well you took the accident that you had the right frame of mind to do so. I went to your page, liked and tagged. May many enjoy the pages to tell others of it's wonderful read! Very glad you are alright. Big Hugs. What quick reflexes to step on the gas and get the car forward enough so you weren't hit right on. Some angel watching over you. Glad you are okay and sounds like you're healing okay and spirits are up. Glad it wasn't worse-heal up. Hi Kat, thanks. When you go to the movies and hear that sound of rending metal, it doesn't have the same effect. Hearing right at your ear as broken glass flies everywhere is much more impressive. I'd rather not do that again. What an experience to go through. So glad you could "walk away." Amazing how we writers do dual-process in situations like yours. Hope you've journaled all those feelings that swirled around to use in your next book. Thanks Cora, I've always had quick reflexes and I never panic until a few days later.That's when I have the melt down. Yes indeed, somebody special was watching over me, there's no doubt. Wish I could even though I am not sure where up is. Glad to know you both are Reiki Masters that helps a lot. I am currently busy trying to finish my MS that will hopefully be my first book published. When did you start writing; you have so many published. I hear that being a prolific writer is the best way to make a decent living at it. I am 48 and getting a bit of a late start. So glad you're okay! You made me smile at the book sale, and the blogging in your head while waiting in the ER. 🙂 What else is a writer to do? I was thinking about you since I saw Charis' post on Facebook. So glad to hear you're OK! And LOL at pitching the books and composing blog posts en route to the hospital – a true writer! OMG! I saw this picture on the FB ROW80 page. So glad you are okay. Wow. I love that the writer in you still managed to get word out about your book. Awesome! Owie! Take it easy for the next few days! Hi Kristy, thanks. Hugs back to you. Hugs are healing. Yep, I don't want to try that again. That was too close for comfort. Gracious, that was quite the hit! The jaws of life!! Holy cow! I'm glad you were able to pitch your book though. When life gives you lemons . . . So glad you're okay, Prudence. Valkyrie Rising wouldn't be the same without you. Well, it probably wouldn't even be – period – so you're gonna have to stick around for a good long while! That picture scares me. I didn't know that anyone could walk away from that and I'm so glad you did. I must say that I like your style and dedication. After such a traumatic event, wouldn't everyone compose a blog post while waiting in emerge? LOL! Good for you. I am so glad you came out of this unscathed. You have a great attitude to the whole thing too. 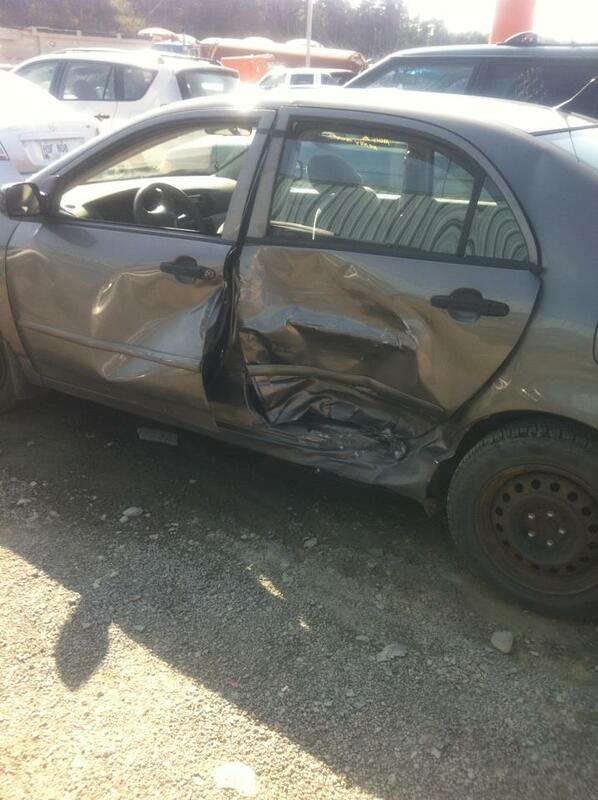 I have been involved in a couple of car accidents (and I don't even drive?) – the one before the last I recieved multiple skull fractures and severer whip-lash. My mum hurt her knee, the other passengers received minor whip lash. The car was old and the seat belt broke (unclipped) in the back. I have a large scar down the front of my forehead, my memory is awful and I know I'll never drive now, but it could have been so much worse. We have to be grateful for any mercy life throws our way in these circumstances. I'm not religious, so I thanks luck or fate or whatever else it might have been. this article popped up in my bloger list and i just had to stop in. you've walked away from a tremendous experience which could have been all kinds of ugly. you know, of course, more than anyone how true that is. thank you for sharing this experience. Thanks Patricia, I guess I must be living right. tee hee I was back in town today and traffic is even worse. Long weekends. ew! I got behind a guy who would move, he was having a smoke and talking on his phone. I walked up up and asked if he wanted me to get him a coffee to go with it. he got embarrassed and darted out into traffic. Some guys have no sense of humor. Hi Patricia, don't worry, we MacLeods are viking stock. Just like the Timex watches we take a licking and keep on ticking. Hi Shah, I am so sorry that happened to you. Sometimes fate just doesn't play fair. Yes, it could be worse. I have seen the carnage of bad accidents on the highway; it's not pretty. Forty years of defensive driving all came down to one split second, but it worked. Hey, since you have a Harry Potter scar, maybe you can do magic too. Just think of the possible stories in that one. Don't worry about the old car, she's a gonner. There won't be any issue there I don't imagine. Hi Grinelda, yeah, it was a close shave alright, but al's well that ends well. 🙂 Thanks for stopping by. So glad you're ok! Car accidents are such scary things. Quick thinking on your part to speed up like you did. Hope your soreness goes away soon. Thanks for the good thoughts, Tammi. I am good as new today. Thanks for stopping by. How amazing that you had the presence of mind to speed up since that other car was headed right toward you! The photo makes it all real. And in a moment, everything changes. Good on you for remaining composed — and for thinking about your writing. I believe that somehow this experience will wind up in your stories, but the best outcome is that you are well. Stay well. Keep writing! Hey Debra, thanks. Yep, I used up a bucket of luck that day. Of course I pitched the book, I was strapped down with nothing else to do. hehehe It seemed silly at the time, but I just couldn't help myself. Goodness gracious! I'm glad you're okay. That car certainly took a hit. Take care of yourself. Our car got rear-ended this summer, and I was sore for a few weeks. Hi Julie, sorry it has taken so long to respond to you. I just found your comment in the spam folder. (fussy old Blogger) Thanks so much for the kind words and thoughts. It did take a few days, but all's well now.